Well now…the novelty of that wore off quick! 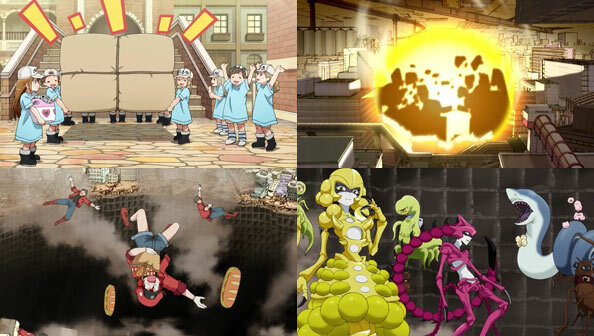 The first episode of Cells At Work was a fun romp in the spirit of Magic School Bus or Where’s Waldo (or some show I haven’t watched that’s it’s more like than either of those). But not long into the second episode I…I just couldn’t. A voice-over re-introduces the characters and their function, as if they didn’t just do that last week, and other than that, everything’s too…straightforward. There’s not much of any clever wit to anything. Everything happens the way you expect: when the skin (city) endures a scrape (fissure), it starts bleeding (flushing the people-cells out into the void outside). 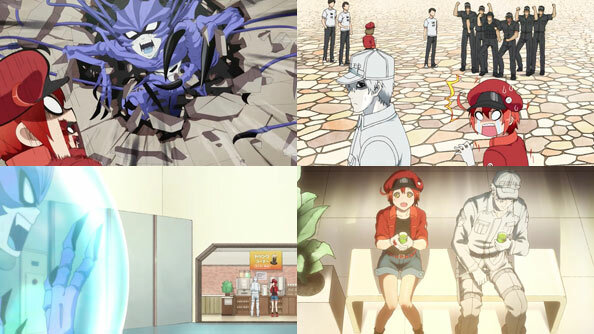 The platelets only encourage questions like “will they ever grow up?” or “why is child labor cute?” And of course, the red blood cell protagonist is lost again, because she apparently always is. Hataraku Saibou isn’t bad, nor is this episode actually that much worse than the first. It’s just hard for me to watch personally. I actually scrubbed through the end of the episode. It’s a show that very genuinely and enthusiastically want to teach you stuff about the body while entertaining you with the hijinks of its characters. But maybe I don’t want to learn, or at least learn like this. It’s just too sincere and twee for me. It’s not you, show, it’s me. 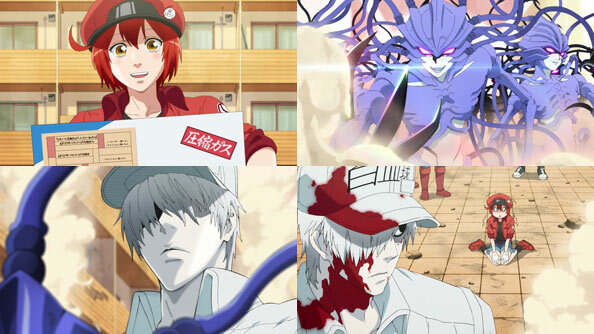 Hataraku Saibou, AKA Cells At Work, delivers exactly what the title promises, only the cells in question are anthropomorphized. We’re introduced to a red blood cell AE3803, who is very new to her job of delivering oxygen and other nutrients to various parts of the body (and gets lost easily). When a band of pneumococci (germs) invade, the red blood cells rely on neutrophils (white blood cells) like U-1146, who is initially all business (the germs have blood like people too) but softens a bit as he spends more time with AE. AE and the remaining germ end up bumping into each other by accident, and U has to save her on more than one occasion as they traverse various parts of the anatomy, represented as parts of a huge bustling city. Cells at Work feels like a cross between Working!! and either Futurama’s “Parasites Lost” or the Magic School Bus book in which they go into the human body. So yeah, it’s a bit of a silly premise, but well-executed, well-paced and full of fun little comedic beats that keep things from getting too clinical. Kanazawa Hana provides a manic energy and ebullience to AE. While this episode was primarily how a sneeze can occur (treated as a monumental rocket launch) I imagine future eps will cover other bodily functions, doubtless involving other cell-people.